Samsung is believed to be working on a hologram projection technique for its next-generation Galaxy smartphones, something you would associate with movies like Star Wars. The information has come out a patent filed by the South Korean company with World Intellectual Property Office (WIPO) and United States Patent and Trademark Office (USPTO). 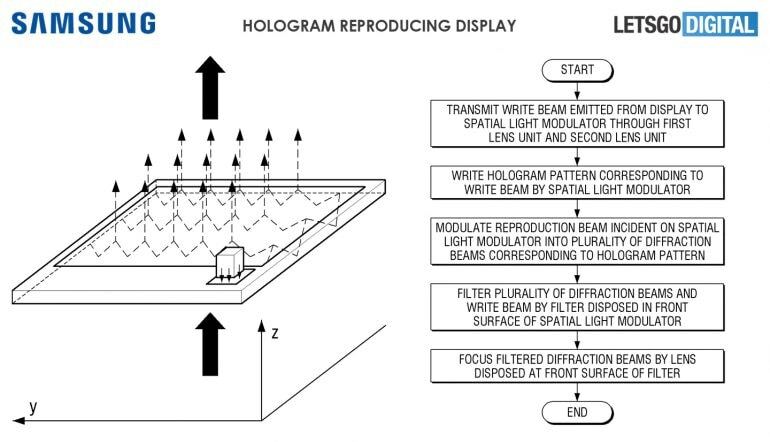 The patent titled ‘hologram reproducing apparatus and method therof’ was published on November 29, 2018 and describes precisely how a 3D image can be projected into the air using smartphone display. According to patent description (first spotted by LetsGoDigital), Samsung is looking at a possibility of 3D image projection from a phone display connected with a relay lens that contains a series of microlenses. It is being called ‘Hologram Reproducing Display’. The patented futuristic technology by Samsung appears way ahead of its time. The details given in papers describe operation of each individual micro lens and filters to be used in the operation of the light guide plate. It is noted that the relay lens used in ‘Hologram Reproducing Display’ will contain a spatial light modulator (SLM) with a filter. The SLM function is to ensure accurate hologram pattern after which it will get projected as a light beam from the display. These patents were filed earlier this year, and it could just be a matter of time before Samsung might turn into reality with a smartphone next year on it’s 10 year anniversary of Galaxy S series. So far, we’ve only seen Red Hydrogen One showing 3D hologram images within the display with select apps only.